Schools Water Efficiency ProgramOne program. 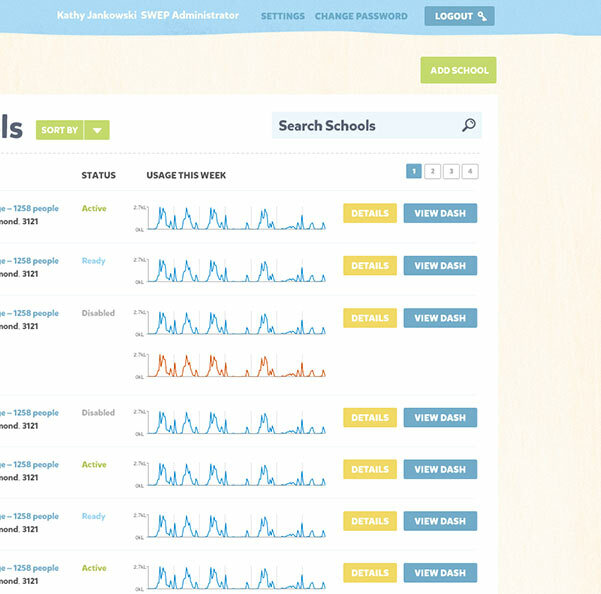 1000+ schools. More than 1.2 billion litres of water saved. 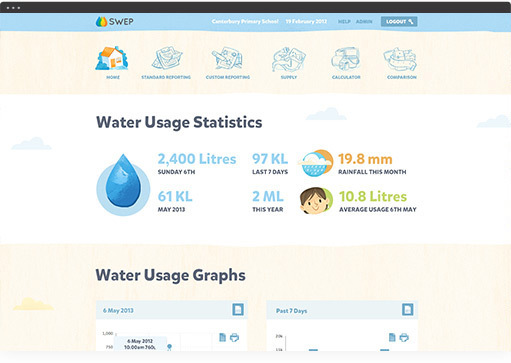 SWEP is a simple yet powerful Victorian government initiative educating our kids on saving water, and changing attitudes along the way. 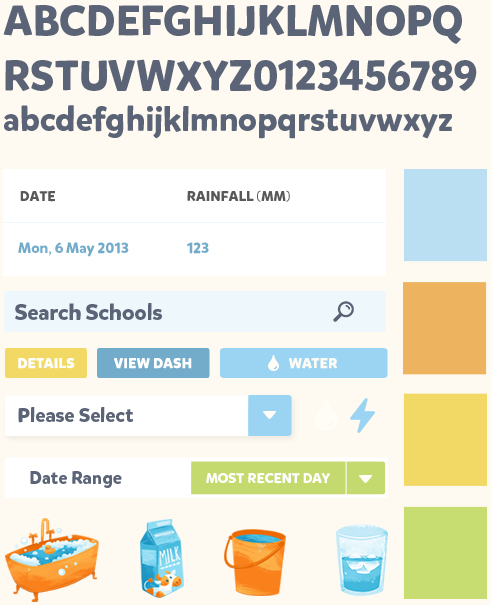 SWEP is a data-logging interface that tracks water use in Victorian schools to identify leaks. If schools can find leaks early, they save water and money. Money that is better spent on computers, equipment and other resources. 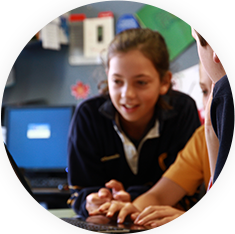 Tested on real kids in the real world, the program aligns to the national curriculum from grades 2 to year 10. SWEP is generating big results and world-wide acclaim for its efforts in sustainability, innovation and education. 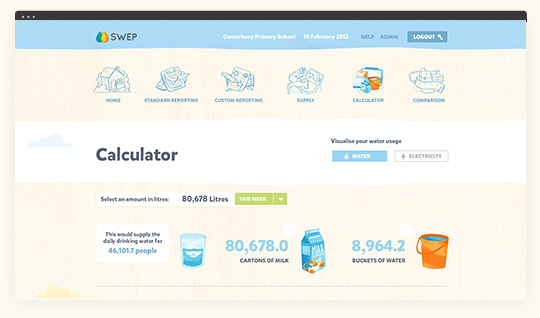 SWEP – making schools more sustainable through data made beautiful and meaningful by August. The concept of data-logging isn't new, but what makes our version of SWEP a success is its simplicity. Back in 2011, when August became immersed in the project, SWEP was already a successful initiative. But the problem was this: what could we do to better engage students and save water at the same time. The answer lay in the combination of technology and design. We made data beautiful and accessible to the SWEP audience. Two years later, we achieved our goal: SWEP's reach extends to more than 1000 schools. Hundreds of thousands of active participants are joining in the conversation. SWEP does all the hard work behind the scenes to provide schools with data on their water usage. "We can compete against other schools and save more water." 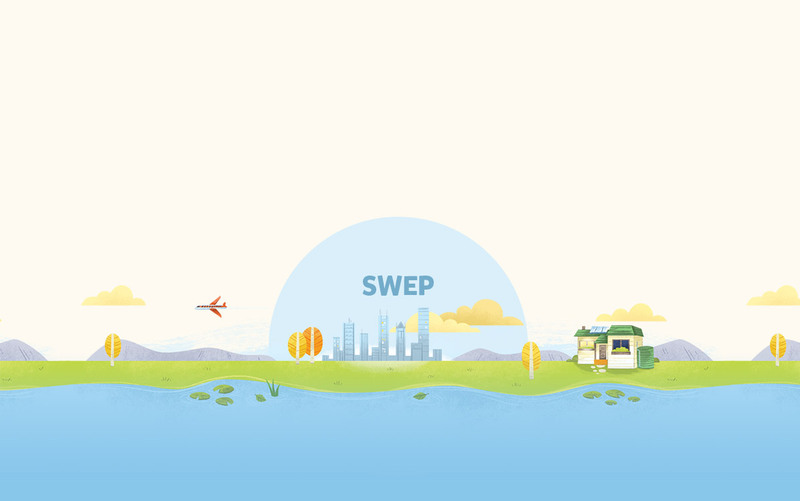 The SWEP website and interface uses lively illustrations, friendly typography and a bold colour palette. By adopting a vibrant aesthetic, data becomes beautiful. We get excited about data here at August. It gives us the evidence in which to test our assumptions and pursue our ideas. So in devising the aesthetic for SWEP, it was essential that data was presented in a fun and appealing way to relate to kids of all ages. Through colour, illustration and typography, we hoped to challenge the notion that data is boring. Technology Bringing data to life. that tracks water usage in schools. The simplicity of the SWEP interface hides a complex system architecture that connects multiple user groups with data from a number of suppliers. 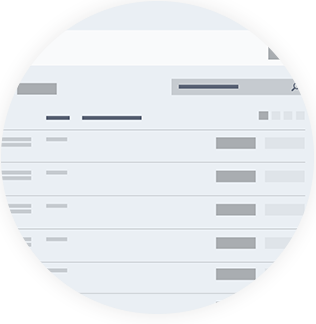 The interface updates every 15 minutes and provides users with status boards and easy-to-interpret graphs. 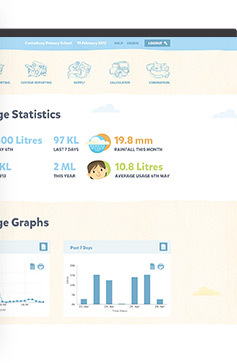 The data gives teachers accurate, practical, evidence-based material to engage with students by showing rather than telling them about the benefits of saving water. In two short years, SWEP hit its target of getting 500 schools to sign up for the program. As the builders of the platform, August is immensely proud to be part of Victoria's water revolution. SWEP is a globally recognised sustainable education program. It may be used in schools, but its inherent value is in provoking behaviourial change. The next generation is learning why it is important to save water at home, in their garden and in the community. Initiatives like SWEP can nudge people towards a shift in attitude. And this can only be a good thing. The lowdown The SWEP journey. SWEP is a hugely successful platform delivering outstanding results. It's also an awesome example of how Government and decision-makers can drive change and encourage people to act. The idea of a data-logging platform lends itself to tracking electricity and solar energy. Bill shock? Gone. Wasted water? Gone. Wasted electricity? Gone. What they're saying about SWEP. A large part of the success of SWEP is the way in which schools have embraced it – in the classroom and beyond. We were over the moon when SWEP won this United Nations award. It is awesome global recognition for a platform built locally in Melbourne. A brief timeline A short history. More than eight years in the making, SWEP continues to evolve and get better. Here's a snapshot of where the program has been and where it's going. SWEP is launched by the Victorian government as part of the Water LILI (aka “Live it. Learn it.”) data-logging module. Its focus is on plumbing repair works in schools. The programs is wildly successful and runs for three years. 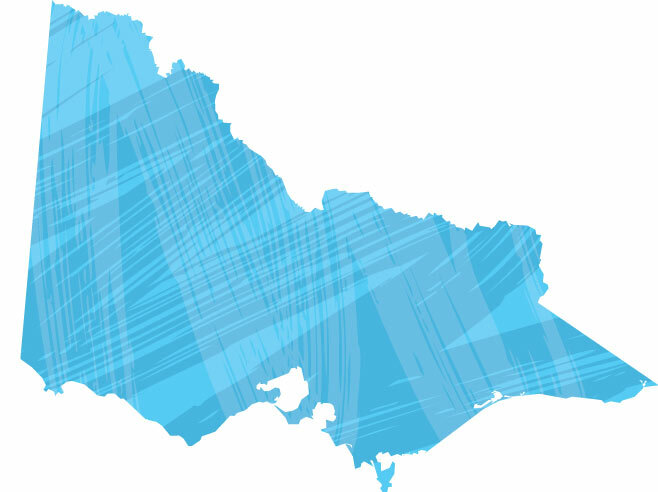 2009 Victorian dams dwindle to an historic low of 25.9 percent. Saving water is top of mind and of concern to all Victorians. A report is commissioned to survey 60 schools on SWEP. The findings are clear: teachers demand better use of technology in the classroom and more ways to engage students. Two days after installing SWEP data loggers Wodonga Secondary College identified a leak of approximately 1200 litres per hour due to a cracked boiler pipe. Immediate repair of the pipe reduces the school's water leakage by 90 percent. SWEP gives schools tangible outcomes. Mill Park Secondary College bills drop by 50 percent in the 12 months since installing SWEP data loggers. SWEP wins the United Nations Environment Day award and is a finalist in the Sustainia100 annual guide. Celebration time as SWEP reaches its target of 500 schools. The future is now: solar, electricity and a more robust platform are on the cards for future development. Stay tuned. 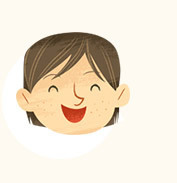 Come and meet some of the friendly characters, you'll find at SWEP. My name is Ursula, and I'm concerned about the environment. SWEP can make a difference at your school, too! Hey, I'm Jacob. 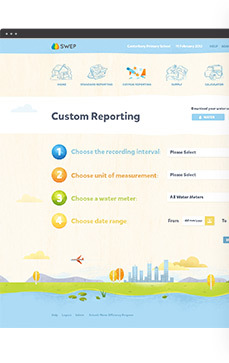 Data-logging shows us how we can save water at school and at home. 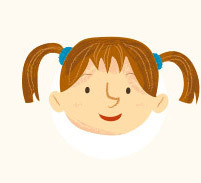 Hi, I'm Lisa. We use SWEP in maths class. 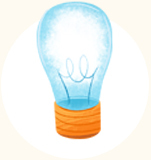 It's an awesome way to learn about saving water. The beauty of the SWEP aesthetic is its simplicity and warmth. From the moment you log on to the platform, you're greeted with a site that has married technology with a visually appealing design. The platform is punctuated with pops of colour and iconography that work to reinforce the SWEP brand, but also makes sense to the people using the platform, particularly younger students. Cute schoolkids, everyday objects and idyllic scenery help turn data logging and tracking into a playful and fun learning experience. 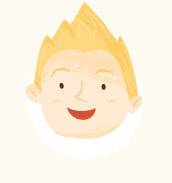 We chose an illustration style that was fun, fresh and playful to deliver a big personality hit to the SWEP interface. Illustrations of common objects align with the calculations by way of comparison. They help put water usage in perspective. To bring the words to life, our design team chose Mikado as the primary font. Designed by Hannes von Döhren, it's a fun, friendly typeface with a casual feel. We refreshed the SWEP logo, giving it a clean, modern feel. It's not hard to see that we were inspired by the need to conserve water – the SWEP logo is a metaphor for making every drop count. The central platform processes data from loggers attached to school water and electricity meters, generating information for students, teachers and facility managers to analyse. The platform includes reporting functionality, analytics and third-party systems integration, all of which are automated where possible. Every morning, data is received from each of the suppliers (both water and electricity). The data is processed and cached to ensure users can query the data quickly and efficiently. A number of APIs are set up to facilitate delivery of this data in common formats. Each day, we process 15-minute interval data from 1000+ schools, with more than 850 meters, resulting in over 80,000 individual meter readings each day. The SWEP platform is built on a fully open source technology stack. 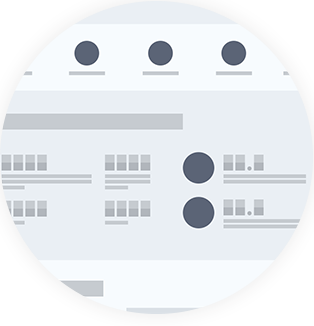 We used Symfony2 for its ability to deliver a robust framework for ongoing development. The diversity of the target audience means a complex set of authentication and authorisation requirements. 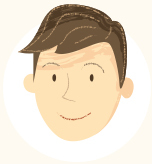 Using Symfony2 allows us to limit data access to specific users based on their individual requirements. The database is hosted on a secure Linux server that is monitored 24/7. We aim to provide a seamless hosting environment for the SWEP platform. In 2014, SWEP had 52 minutes of downtime. That's 364.96 days of uninterrupted uptime. The lowdown SWEP is electric. will soon be tracking a school's electricity, too. The idea of a data-logging platform lends itself to tracking electricity, although the challenges for power are greater than those for water usage. Why? Because schools properties need the power to be on at all times, for things such as alarms, lights and fridges. It makes it that little bit more difficult to identify ‘problem' spikes of electricity in the same was as we identify water leaks. Four schools are participating in a trial SWEP electricity program, with a plan to roll out a pilot program to 100 schools. 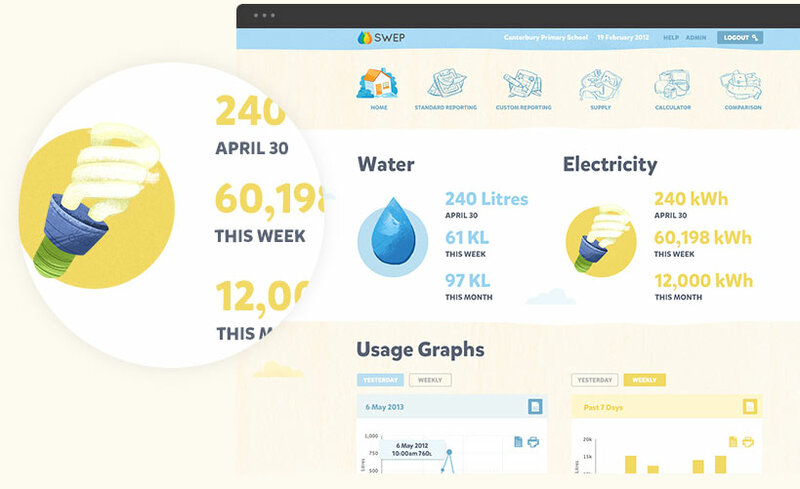 SWEP electricity is designed on the same platform as the water component and leverages the existing data management system. With power prices on the rise, tracking water and electricity usage using the same platform just makes sense. Technology + Sustainability Global recognition. While we've not in it for the awards, we we're over the moon when SWEP won the United Nations award in June 2014. It is awesome global recognition for a platform built locally in Melbourne. The unique combination of innovation, sustainability, design and technology proved a hit with the judges. In the same month, we became part of the Sustainia 100, an annual international award that honours outstanding performances within the sustainability arena. SWEP was selected for Sustainia's annual guide that highlights 100 innovative sustainability solutions from around the world across a range of sectors. Sustainia100 puts us in inspiring company – from growing trees in deserts with minimal water usage to electric cars, bike-sharing apps and products that turn food waste into exotic leather – we're humbled to be recognised for our part in SWEP. The Sustainia Award is changing the focus of the climate change debate towards tangible solutions that can make a real difference. And then there's Arnold Schwarzenegger. The former Governor of California chairs Sustainia100 in what we think must be one of his most interesting roles to date. United Nations Association of Australia (Victorian division) World Environment Day Awards. The Lowdown What they're saying about SWEP. Part of the success of SWEP in how schools have embraced it in the classroom and beyond. Here's some of the things people are saying about the program. "Data loggers fitted to water meters enable schools to monitor and manage their water usage, increasing their efficiency and enabling them to fix problems such as leaking pipes quickly. By using the supporting online education materials at the same time, the school will save water and money and set a great example to students." "It is up to our children to carry this through to future generations, so it is essential that they understand the importance of water and how to use it in the most sustainable way possible."